There are a number of reasons why a Facebook Group or Page may not show up when you try to add it. Read more about the common reasons for this, and how to fix each one. What if my pages/groups still don't appear? 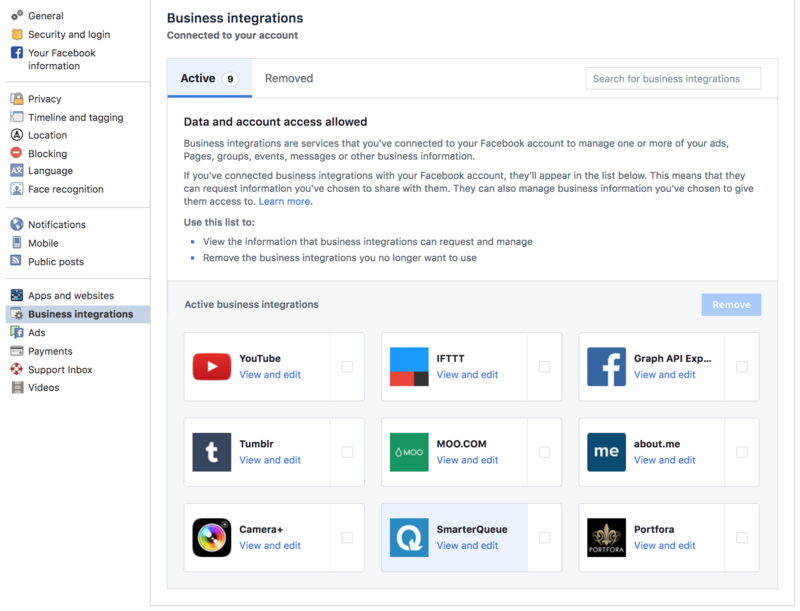 What Facebook permissions do I need to grant? You personal profile must be the creator or admin of a Facebook Group or Page in order to add it to SmarterQueue. On Facebook.com, you must be logged into the Facebook Profile that is an admin/creator of the Facebook Group or Page you’re trying to connect. 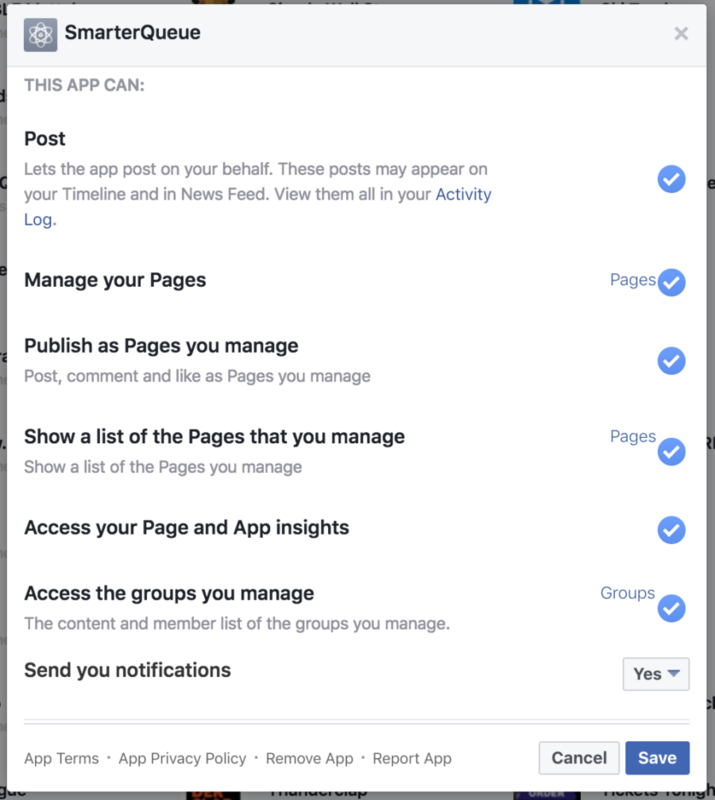 When connecting a Facebook Group or Page, you must allow all permissions when you are prompted. You should re-grant permissions if you failed to allow the permissions when you originally connected a Group or Page. During the permissions step for pages, you may have clicked “Review the info that you provide”, which lets you choose which of your pages/groups to grant us permission to manage. You can turn some pages off, which means we won’t ever show them when you try connecting them in SmarterQueue. 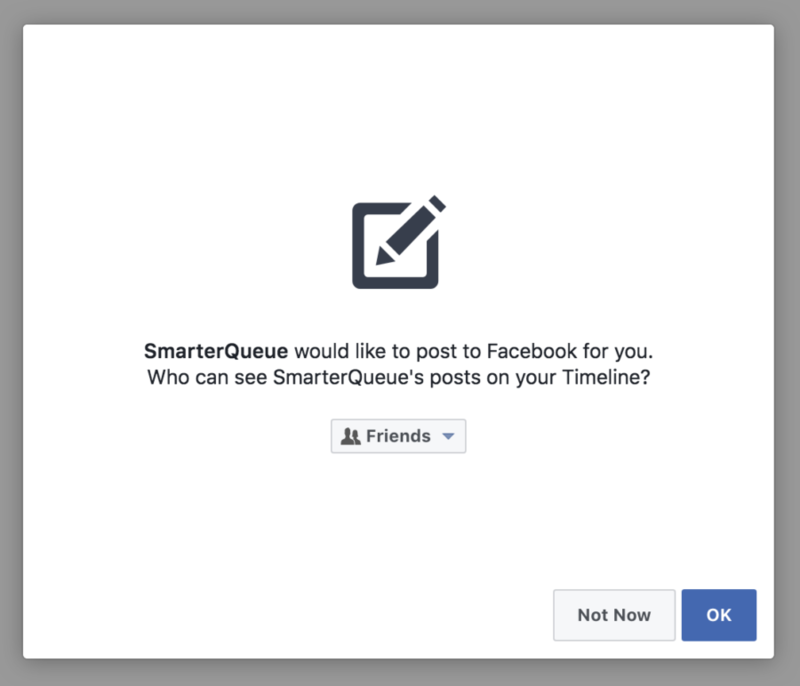 NOTE: if you create a new Facebook page/group AFTER you’ve connected to SmarterQueue for the first time, your page/group won’t be visible to us. Click View and Edit on the SmarterQueue app. Known Bug as of 13th June 2018– the View and Edit link is broken for some users. This has been reported to Facebook. In this case, you should check the box next to SmarterQueue, click the Remove button above, and then re-connect your page/group in the SmarterQueue website, making sure to grant all permissions. You may see “Groups” as a link, next to the tick mark on the “Access the groups you manage” line. In each of these cases, click on the “Pages” or “Groups” link, which will show you a list of all your pages/groups. Make sure that the pages/groups you wish to manage are ticked. Once you’ve saved those changes, try adding your page/group again in SmarterQueue. If you don’t see links to edit which Pages/Groups have been granted permission, it’s likely that you have granted permission to ALL pages already. If you still can’t see your Page/Group, you can click Remove Business Integration at the bottom of the popup. Note: Make sure you DON'T check the box to delete all your posts! 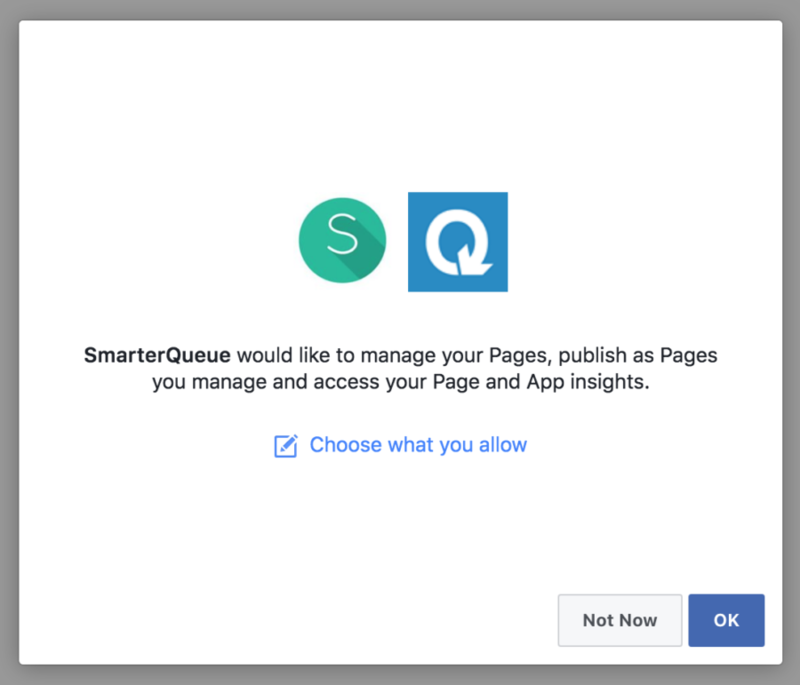 Once you’ve removed the SmarterQueue app from Facebook, you can return to SmarterQueue website and try to connect your Page/Group – it will ask you to grant permissions afresh, so make sure you grant all necessary permissions, and your Page/Group should appear. We do not access for any information beyond your public profile, so there are no options in “Review the info that you provide”. Even if you do not plan to post to your personal profile, we still need your permission to publish to your Facebook Pages/Groups on your behalf. 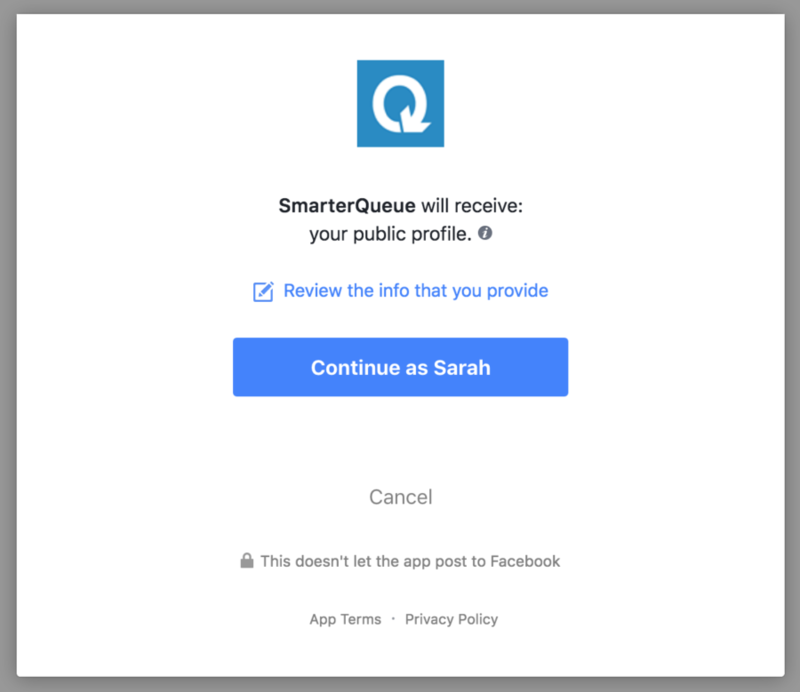 We will only ever post to your profile if you add your personal profile in SmarterQueue. 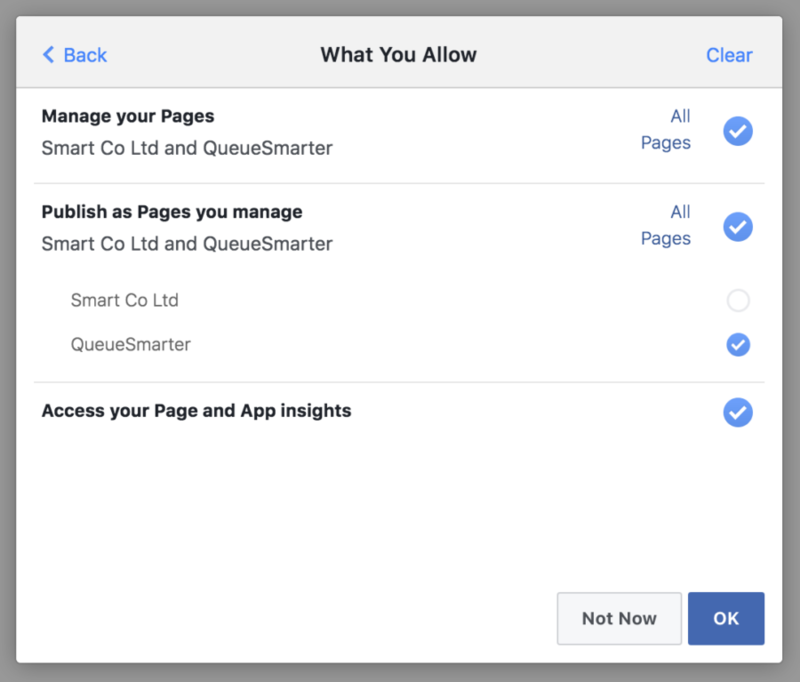 To avoid future issues, you should click “OK” on this permission popup – otherwise if you click “Choose what you allow” and only grant permission for specific pages (see below), any new pages you add in the future will not appear in SmarterQueue until you edit the granular permissions.